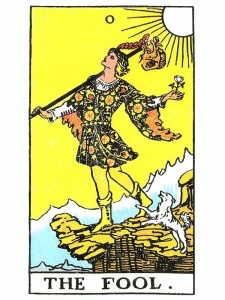 The Fool indicates new beginnings will now be presented – fresh challenges. Let your mistakes be your lessons – “look before you leap”. Your choice will affect your life path and others will effect this choice. Consider all the aspects as well as the consequences to yourself. Once you have made your choice you will see your new goals clearly, a strength of purpose will be revealed and you will overcome any fear that exists. Hard work, honesty and ethics are your keys – use your wisdom and opinions in practical ways and trust that marriage and relationships will provide a firm base or foundation. The Fools esoteric name is LOVE – he represents “good” and teaches the “know-how” of passing from intellectuality, which is moved by the desire for knowledge – to a higher knowledge based on love. “Transformation” – the “ego” is no longer the author of the “act” but its receiver, through the decision to sacrifice the intellect to spirituality so that it grows and develops. The human endeavor is united with the action of grace from above – love aimed at universal salvation through the transformation of mankind and Nature. The souls journey begins with the separation and opposition of the spiritual and intellectual elements. This advances to a kind of “peaceful coexistence” which soon becomes cooperation. This cooperation, having proven to be fruitful – becomes a complete fusion of these two elements. Finally logic becomes transformed from “formal” logic into “moral” logic, operating with the “value of values” – LOVE. Your prayer is never in vain or without effect. Leap into this new phase of life – return to the “child” within you, be open to new experiences – be innocent and spontaneous, curious and playful. You are not here to cry about the miseries of the human condition, but to change them when they are not to your liking. Trust in the Universe, have faith that the Universe will take care of you – trust your Creator. Your spirit desires to break free of this boredom and take some risks. You are a Being not just a “body” – unlimited by nature. Through the joy, strength and vitality that is within you, begin to create your spirit faithfully and beautifully in flesh. Trust in your rightness and your completely original existence in this time and space. You were born into the flesh to materialize as best you can the great spontaneity of your nature, your genius is found in your childhood passions – believe that good results will come from the work done in your mind and trust that if you do the work – you can rest assured of the results. Launch into your new adventure totally unafraid of the consequences – write your script and create your own play – be joyous now, for the possibilities are boundless. Mentally – be inquisitive. Emotionally – express your feelings without reserve. Physically – have fun with life. Spiritually – search for truth and seek to grow. “Doubt” is more than just a psychological state of indecision – it is your souls temporary residence between the physical and the spiritual. It is the question “to live or not to live” – “to be or not to be”. When you experience fear – keep going – you are never alone and your journey will result in knowledge, peace and liberation as you experience joy and adventure and learn to see through the illusions. The Fool – is what the world sees when they look upon someone who is truly enlightened – he does not follow their rules or share their weaknesses, so he appears to be a fool. The World represents the same enlightened person viewed from inside, by himself. Nature is always in harmony with the spirit who acts from instinct. Your passions have been raised to a higher level. You carry your experiences with you, but they no longer control you. Your higher instinct fills and transforms all experiences – do not censure your thoughts – be open – minded and play with your ideas. You carry your wand of power so casually now that the world hardly notices it and the spirit force is always available to you, for you are not consciously trying to direct it. LOVE urges you to keep going, rather than settling for what you have already achieved. LOVE urges you on in spite of your fears and allows you to move without thought, to hold onto your faith and optimism and have faith in yourself and life. Remain practical when the burdens become too heavy – follow your instincts and feelings and allow yourself to flow gracefully with life. Experience life from moment to moment and stop trying to “plan everything out” – expect a miracle. Here is the immortal mortal, invincibility. The magician has learned all his lessons. Complete lack of fear, through innate knowledge of death. Understanding of death, both as illusion and hard reality, that at birth we begin to die and at death we begin to live. Here is complete balance, centered awareness. Transcendent of space/time. To earthly knowledge has been added much of the knowledge beyond the veil and the ability to see beyond earthly duality while living in it. The ultimate optimist, appears very lucky to onlookers and is indeed charmed. There is much good humor in all things. Unmitigated joy, walking on air as here is the ability to see the positive lesson inherent in any duality with man’s will. The fool in knowing that he knows, also knows what he does not know. His reaction is “Oh, but of course!” When opposites reveal themselves to be but two sides of the one – the same, whenever we discover the surprise in what was before so hard to see – there is a relief, a lightening of the spirit that comes with the enlightening of the mind. In what area of your life are you operating entirely on faith and trust? What are you feeling foolish about? What would be fun to do if you could do anything you wanted? In the first position: Lifetime as witness to lessons already learned, to help others move more efficiently. Outwardly, you seem one of life’s chosen, lucky in all you do. Actually, this is to leave you with energy for other’s problems. You are sophisticated and wise, as well as a pleasure to be with and so people seek you out. In the second position: Fortunate circumstances behind you. Natural ability to provide. Resourceful, material ease, good health – prowess. In the third position: Hear ye! Hear ye! Listen to your soul. Yes, you can walk your talk. Make your moves now. Use the full force of your personality. Be yourself by letting your talents express themselves. Let up on yourself, be more carefree and ironically in so doing you will meet and accept true responsibility for your Karmic Contract. In the fourth position: You are a free spirit, with a raw love for life and the freedom to live it as you please. You love everything virtually equally and to the maximum. Here is the kernel of the adventurous heart. In the fifth position: Complete confidence, self – respect, optimism, resolution. Plans on – line and integrated in present affairs. Continuation of present course, only more so. Very much on track. Ideals mixed with healthy pragmatism. Implementing principles into worldly affairs. In the sixth position: Integration of higher emotions and spiritual ideals into day to day affairs, relationships and creativity. May have actual teacher/guide at hand, learning first hand how to be in the clouds and on the ground at the same time. Balancing love of God, love of guru, love of self, love of others as different and necessary aspects of the same love. In the seventh position: Time to balance prudence with daring. Feeling the pull to excellence by your higher mind, toward living fully in truth. Facing the demands of your karma more fully than ever before. In the eighth position: You are well – positioned, living your principles, walking your talk. Well – mannered, pleasant, entertaining. Highly ethical, a role – model. Your spirituality is main – lined in your life, although you may not be conventionally religious at all. Your work may literally be spiritually oriented, helping teach others what you have already learned. In the ninth position: Enjoyment of life situation. Love of self and others. Open to relationships. Creative juices flowing in support of Karmic Contract. The subconscious is an ally, not an enemy, of the conscious self. In the tenth position: Listen and hear as you speak to yourself, urging your soul on its true course. Accept your tasks and your load will be light. Deny them and your burden will be heavy. I like your site, it has unique content, Thanks. You are truly heaven sent. Thank you for capturing this journey in the most beautifully written post. I pulled the Full card for today’s energy and was brought here. So grateful to you and the Divine for the absolute alignment and confirmation. Happy New Year and Happy New earth. Much love, light, and bountiful blessings to you beautiful soul. ?? ?